Lionised by the Morning Star newspaper, Assad apologist Vanessa Beeley denied hospital bombings in Aleppo and smeared White Helmets rescue volunteers. Beeley addressed an ultra-Stalinist cult meeting in Bristol, ridiculing Syrian health workers. When a Syria Solidarity UK member questioned Beeley on hospital bombings, he was put in a chokehold by meeting organisers and ejected. On 17 February Vanessa Beeley, associate editor of 21st Century Wire and a frequent guest of the far right conspiracy blog InfoWars, http://www.infowars.com/ gave an illustrated talk in Bristol, billed as a challenge to mainstream media reporting of Syria, particularly of the fall of Aleppo. Four members of Syria Solidarity UK—including myself—went along to join Bristol members who were leafleting the meeting outside. The hosts were ‘Bristol Open Inquiry into the Bombing of Syria,’ a CPGB-ML front aiming to ‘end sanctions on Syria; stop arming terrorists.’ The CPGB–ML (Communist Party of Great Britain–Marxist Leninist) is an ultra-Stalinist cult, expelled from Arthur Scargill’s Socialist Labour Party, and from Stop the War Coalition, for openly supporting Assad and Ghaddafi. The meeting was attended by 70-90 people, not necessarily CPGB–ML members or supporters. According to the people around me, many had been informed about the event by STWC. Beeley was introduced by Mehraz Shahabi, an open supporter of the Iranian regime, who passionately defended Syrian ‘sovereignty’ against imperialism. Vanessa Beeley spoke for a full two and a half hours on her recent trips to Aleppo as a self-styled independent journalist. She presented video clips which she claimed were interviews with escapees from the ‘jihadist prison’ of East Aleppo, taken mainly around the Jebrin Registration Centre from 14 December onwards. She did not explain how she obtained access, nor who her interpreters were, nor why the interviews were conducted in public. They were vox-pop snippets on the street, with the interviewees praising the Syrian Arab Army for giving them food and denouncing jihadists for giving them none. There were no detailed or in depth interviews—they needed extensive commentary from Beeley to yield the sense she wanted. But to someone uninformed about Syria, or willing to view mainstream coverage of Aleppo as propaganda to support an imperialist project of regime change, they could be effective. From there, Beeley ranged over wide variety of topics to which I cannot hope to do justice in this short report. She has a butterfly style—no coherent narrative thread and often returning to earlier topics and tropes. It is a rapid fire technique—impressive live, because there is no time to stop and examine anything in detail. She does not complete her thought, so you are never sure what she is actually claiming. I will comment on a selection, to illustrate. One of the video clips featured Fares Shahabi, a member of the Syrian People’s Assembly, the Assad regime’s rubber-stamp parliament, who represents Aleppo. In this clip, Shahabi is shown at a school with children’s voices in the background. He says that he is working on a project to provide education to children from East Aleppo after ISIS deprived them of proper education. Shahabi emphasises that the education he was providing to these children was ‘secular.’ In reality ISIS had had no presence in East Aleppo since January 2014, after they were thrown out by mainstream Syrian rebel groups, and the Syrian regime’s educational curriculum includes mandatory religious instruction. Beeley showed clips of a tour of a residential part of East Aleppo which she claimed showed damage from artillery rather than from above. She disputed the SNHR statistics about barrel bombs, arguing that if the SNHR figure of 35,000 barrel bombs had fallen on Syria, it would have been the equivalent of several atom bombs and ‘we wouldn’t have a world.’ This is the kind of pseudo-science typical of conspiracy theorists. (Their force was compared by experts to earthquakes, not atom bombs!) She said that SNHR has given figures for barrel bombs ‘since March 2011, but the first barrel bombs recorded are from August 2012’ so they must be inaccurate (disregarding that in its reports and graphs, SNHR always gives figures starting with the month of March 2011 because that is when the Syrian revolution started). She did not push her point to its conclusion—deny the existence of barrel bombs or replace the SNHR figure with her own estimates. She is content to gnaw at one tiny piece of the jigsaw and triumphantly claim that the whole picture has dissolved. Beeley quotes Robert Fisk saying the Al Quds hospital was in operation in July 2016, thereby refuting (she claims) its widely reported bombing in April. Again, disputing a claim that was never made. In fact, MSF stated in May 2016 that it would reopen in two weeks. She used a government list of Aleppo hospitals from 2011 to argue that the many East Aleppo hospitals shown to have been bombed had never existed. There was no mention of the field hospitals and clinics—often set up in basements to shelter from bombing—which were a heroic part of the medical contribution to the resistance in Aleppo. The number of hospitals she presented was completely implausible: there were no more than seven on her list, in a city with a population of two million. The audience was tittering with amusement at the ridiculed nurse, and at media reports of ‘the last hospital’ in East Aleppo. One Syria Solidarity UK member stood up and asked why the audience found it funny that hospitals were being bombed and medical workers killed. He then asked Beeley whether she supported hospitals being bombed, as she didn’t seem to have a problem with the bombing, just with how the media reported it? Beeley didn’t reply to this question, and at this point the Syria Solidarity UK member was grabbed roughly by several of the meeting organisers, put in a chokehold, and forced to leave. Two other Syria Solidarity members stood to support him, and protest at this rough treatment, and were ejected themselves in the same manner. One held up a picture showing a massacre in Aleppo and told the audience that these were the crimes Beeley was denying. He was assured that he would be given an opportunity to ask questions at the end and sat back down again, but was nevertheless ejected. Some other members of the audience protested too, and the meeting came to a noisy and chaotic stop. The organisers defended their action by saying that there would be time for questions afterwards, but ‘these people refused to wait.’ I decided to stay, in the hope of an intervention later on. My friends stayed outside to leaflet the audience at the end of the meeting. The organisers called the police who turned up. Apparently they responded to a call about ISIS in the building! 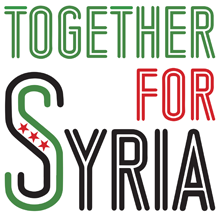 The police said that there was no cause of action against the organisers—it was their premises and they had used ‘reasonable force.’ But when the organisers asked the police to stop Syria Solidarity UK members handing out leaflets, the police defended our right to do so. On sieges Beeley spoke only of two regime-held towns under siege, Kafraya and Foua, completely omitting reference to the fifty opposition held areas listed by Siege Watch as under total or partial siege by the Assad regime. She failed to mention that these were receiving food and medicine by airdrop as well as through negotiation, unlike areas besieged by the regime. Food should never be used as a weapon of war, and sieges against civilians are a crime against humanity—whoever the perpetrator or whatever the reason. But here again Beeley used one small piece of a jigsaw of sieges, in an attempt to obscure Assad’s tactic of starvation sieges and forced displacement of whole populations. White Helmets an Al Qaeda front? She returned to an old obsession at the end—the demonisation of the White Helmets, which she described as a Qatar funded project ‘to undermine Syrian state institutions.’ The White Helmets are part of a ‘shadow state,’ she asserted, and affiliated to extremist organisations. To illustrate this, she referred to a curious phone conversation she had (on the morning the White Helmets were nominated for the Nobel Prize) with the ‘real’ Syrian Civil Defence, to ask why their phone line had been diverted to the White Helmets. ‘An internal mistake,’ she was assured. ‘We’re the official, internationally recognised body.’ What that was meant to prove was puzzling—again she was attempting to refute what had never been asserted. The White Helmets are clear that their work does not extend to regime areas—only to those opposition areas where official regime services have been withdrawn or broken down. This did not last long, with the organisers breaking the meeting into informal chat format after a few questions. There was one question before mine: ‘Why do you use mainstream language to describe the opposition forces as terrorists?’ Answer: ‘If you asked the Syrian people what they would call the people destroying their country, they would be happy to call them terrorists’—so a full embrace of the use of the War on Terror narrative by the Assad regime. I then commented that her videos did nothing to undermine the basic facts of the conflict as provided by numerous sources: over 90% of total civilian casualties in Syria since March 2011 were caused by the Syrian regime and its allies. I said I would confine myself to two questions on the many I had about her material: firstly, her attack on the White Helmets, and secondly her failure to mention Palestinians in Syria. I acknowledged her passion in defending the Assad regime at all costs, but why did it have to extend to attacking first responders? What is important about the White Helmets is what they do—attacking rescuers in cities under bombardment is like attacking the New York Fire Brigade after 9/11. I also complimented her on her passion in defending Palestinians, but did this depend on who was attacking and killing them? She had not mentioned Yarmouk, a refugee camp of 160,000 Palestinians in 2011, subject to a starvation siege throughout 2013, for whom Palestinians in Gaza rallied to provide food when the UN was failing. And why had she not mentioned the 456 recorded deaths under torture of Palestinians; the families of whom were pleading for their bodies to be returned? She replied to the first with a question of her own: did I deny that White Helmets operated in jihadist areas? I replied (despite being interrupted and told I had no right of reply) that in free Aleppo there was an elected local council who did what councils all over the world do: they organise services for residents. The White Helmets were Free Aleppo’s Fire Brigade. Outside the venue, Syria Solidarity UK members picketed, in the company of the Morning Star cartoonist Rob Amos, acting as one of the bouncers for the organisers that evening. 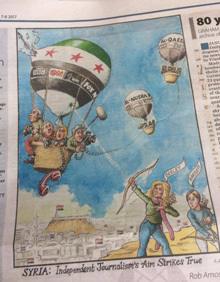 He had previously drawn a cartoon for the Morning Star lionising Beeley and Eva Bartlett as ‘independent journalists.’ We said that dozens of Syrian journalists had given their lives to tell the truth about Assad’s massacres, but he had nothing to say in response. 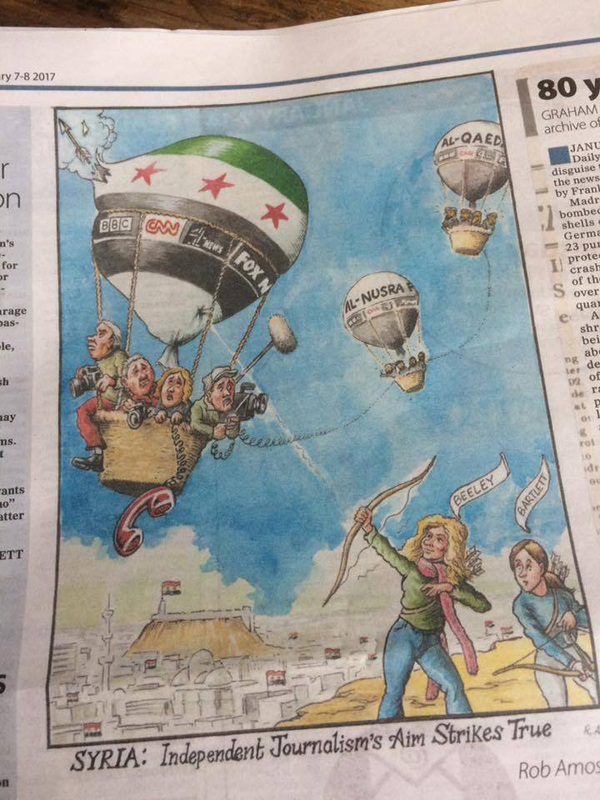 A Syria Solidarity UK member had written a letter to the Morning Star about this cartoon but they neither responded nor published it. As expected, we were abused by some of the attendees: one complimented us on our professionalism, asking who paid us to protest at the event—echoing comments made by US President Trump about those protesting against him. However many other attendees and passersby were curious about our opposition to Beeley and accepted our leaflet. 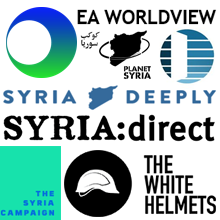 The leaflet refuted Beeley’s claims and contained links to a Syrian Revolution resource page as well as reports from the United Nations and human rights organisations about what is really happening in Syria. We ensured that Beeley’s narrative did not go unchallenged. Uncritical acceptance of a simplistic ‘anti-imperialist’ narrative promoted by the Assad regime, and its useful idiots like Beeley, is an important factor working against justice for the Syrian people, covering up the crimes against them, making heroes out of murderers, and demonising Syrians who have risked and given their lives to help the victims of Assad’s crimes.